If you were shopping at Walmart and on the same shelf you found counterfeit Beats by Dre headphones right next to the authentic product and the liability was on you to determine which was real, would you keep shopping at Walmart? Last week I was shopping online for a LifeProof case for my wife. Of course one of the first places I checked was the retail giant, Amazon. Perfect. 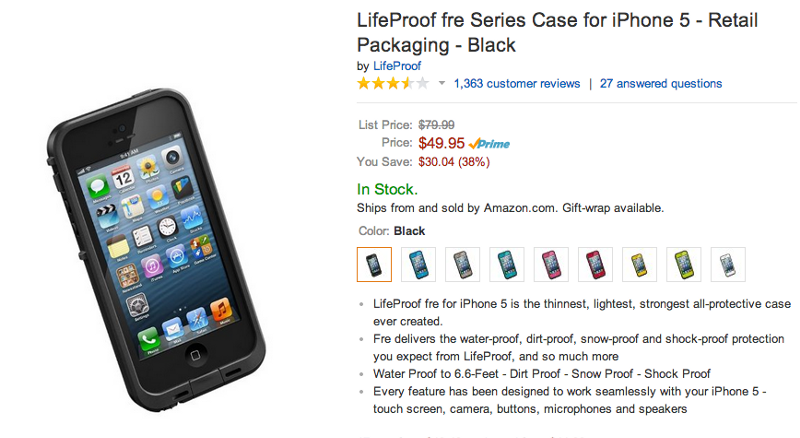 Looks like LifeProof is selling their products on Amazon. I have Amazon prime so the shipping is free. Plus, the case is $30.00 less than on the LifeProof site. Shocked and slightly confused, I dug around to see if I could find more reviews stating a similar claim. Low and behold I found more and more accounts of fraud from people who have purchased this same case. 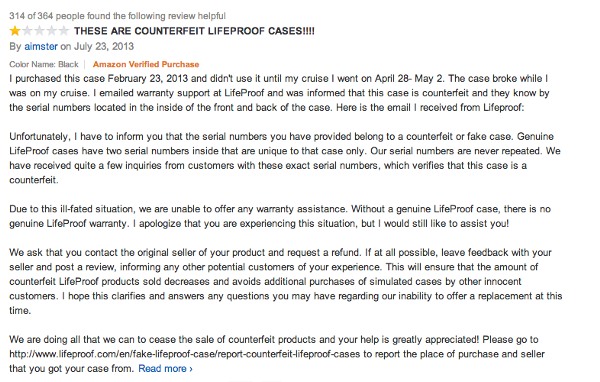 So what is happening that Amazon would allow for a fraudulent seller on their site using the LifeProof name? The problem originates with Amazon 3P. Amazon 3P, or third-party marketplace, allows merchants to setup accounts and sell items in a relatively unregulated environment. The listing shows up right next to Amazon’s 1P listings, or goods sold by Amazon, leaving little differentiation between verified listings and counterfeit goods. Financially, Amazon has little incentive to regulate this marketplace. For 3P sales Amazon only reports fees paid by vendors to Amazon and not the cost of goods sold, thus offering gross margins of 90 to 100% while its traditional retail business has gross margins of about 20%. On paper, this looks excellent to investors. The problem is, more and more companies are having to place warnings on their sites alerting buyers that, while Amazon is an authorized dealer, not all sellers on Amazon are. So Amazon doesn’t verify all of their goods sold? These items are not touched by Amazon and ship directly from the Third Party Seller. This is how most of the counterfeit goods are sold. These items are not sold by Amazon, but are shipped from one of Amazon’s fulfillment centers. This means that items are processed by Amazon but are not necessarily verified. These items are sold by Amazon and are most likely the legitimate product. How does this affect their brand equity? Amazon is faced with the same problem that eBay has struggled with for years. Unauthorized third-party sellers impersonating and undercutting popular consumer brands. Being the largest online retailer is an impressive feat, but what if they were known as a company that sells counterfeit goods that lights people’s hair on fire or fraudulent makeup products that don’t perform as expected. If they allow fraud to become a rampant problem, even drone delivery won’t be able to convince customers to purchase products through them. As eBay found, this can be a very costly business. In 2008, eBay was ordered to pay $61 million to LVMH (Moët Hennessy Louis Vuitton) after it was found that 90% of Louis Vuitton bags sold on the site were fakes. Amazon is the largest online retailer, but if they aren’t able to keep the knock-off products off their site they will be driving consumers to seek out retailers who are offering verified products without the risk of purchasing counterfeit goods.